Newly unveiled statue in Kirkuk pays tribute to the Peshmerga, Iraqi Kurdistan's main fighting forces in Kirkuk, Iraq September 23, 2017. ERBIL, Iraq - A delegation from the Kurdistan Regional Government held talks with the Iraqi government in Baghdad on Saturday, two days before a planned referendum on secession from Iraq. The KRG has said the vote is intended to give its autonomous territory a legitimate mandate to achieve independence from Iraq through dialogue with Baghdad and neighbouring powers Turkey and Iran. Ankara and Tehran are worried that the vote could revive the separatist aspirations of their own Kurdish populations. The Kurdish delegation met with representatives of the Shi‘ite ruling coalition in Baghdad, and with the Iraqi president, Fuad Masum, himself a Kurd, whose role is largely ceremonial. Executive powers are concentrated in the hands of the prime minister, Haider al-Abadi, a Shi‘ite. Turkey said on Saturday it would take security and other steps in response to the planned referendum, which it called a “terrible mistake”. The Turkish parliament convened for a debate and vote on extending a mandate that authorises Turkish troop deployments to Iraq and Syria, and Prime Minister Binali Yildirim alluded to possible military moves. 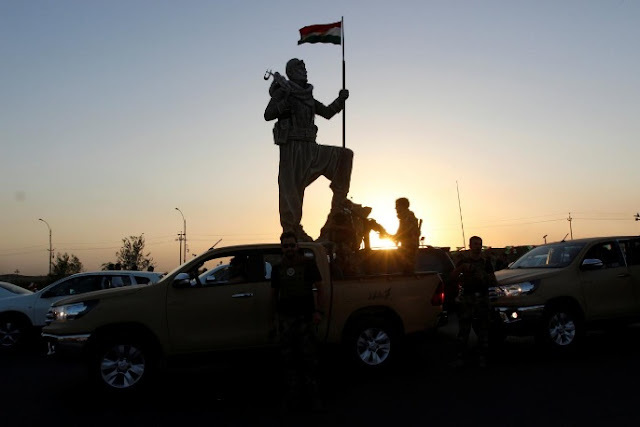 The United States has urged the KRG to cancel the vote, while the U.N. Security Council warned in a statement of its “potentially destabilizing” impact on Iraq. Washington and other Western powers say the vote distracts from the fight against the Islamic State militant group. The KRG counters that its Peshmerga fighters have made a crucial contribution to that fight. A delegation from the Kurdistan Regional Government held talks with the Iraqi government in Baghdad on Saturday, two days before a planned referendum on secession from Iraq.